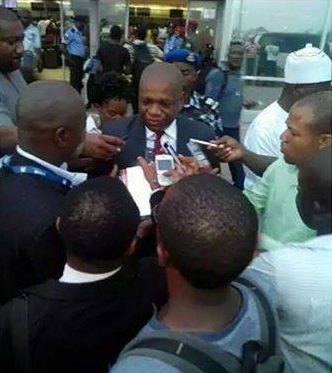 Former Governor of Abia state, Dr Orji Uzor Kalu, while speaking with airport correspondents yesterday as he returned from a trip to the UK, said if things are not properly checked politically, President Jonathan might be the last president Nigeria will have. "When I was travelling precisely on the 26 of April, I left this airport and I spoke to the airport correspondents and I said there was a need to collaborate with international organisations. You see, this issue is not about President Goodluck Jonathan. If we don’t take time and work together as Nigerians, Jonathan might be the last Nigerian President. Jonathan might be the Gorbachev of Nigeria. And that is the truth, so we better wake up. Political class, business class, military, civilians must now stand up to work for our internal security. Internal security is more important than anything we have done and I believe that once we are able to come together Nigeria will be alright. As of now the country is in pains; the country is in problem and some people are taking it very lightly. We are suffering from pains of our people; we are suffering from pains of the Nigerian system. This is not about which part of the country you come from, it is about Nigeria. Nigerian people should take what is happening seriously and I am surprised that the political class and the private sector are still joking with this matter. This is a serious matter. Anybody’s child can be kidnapped; whether it is at Chibok or any other place, Nigerian should take this matter seriously. Can you imagine how many Nigerians that have been killed; how many of us that have been wounded. I want people to be as wise as my grandmother. I want people to take this matter seriously. Those girls kidnapped are our sisters; they are our daughters. It is because none of us has lost anybody that is why to some people; it is looking like a joke. We should stop taking this as a joke and take the matter very seriously in order to move forward.